The selections are part of the 10th round of NASA's CubeSat Launch Initiative. CubeSats are a type of spacecraft called nanosatellites, often measuring about four inches on each side and weighing less than three pounds, with a volume of about one quart. CubeSats are built using these standard dimensions as Units or "U," and are classified as 1U, 2U, 3U, or 6U in total size. CatSat is a 6U CubeSat led by UA students from the Lunar and Planetary Laboratory and various departments including aerospace and mechanical engineering, astronomy, computer science, and systems and industrial engineering. "This is a great opportunity for students to get hands on experience building a spacecraft and running a space mission," said Tanner Campbell, an aerospace and mechanical engineering doctoral student who is serving as project manager for CatSat. In the end, this a team effort involving more than a dozen students spread across campus, he added. The spacecraft selected under the CubeSat Launch Initiative are eligible for placement on a launch manifest at no cost, depending on the availability of a flight opportunity. Launch opportunities include planned spaceflight missions led by NASA, other U.S. government agencies or commercial organizations, as well as deployments from the International Space Station. After launch, satellites will perform technology demonstrations, conduct scientific investigations or provide educational benefits. "Let's say you are flying a space probe across the solar system and you want to beam a lot of data back to the Earth," says Vishnu Reddy, the principal investigator of the mission and an associate professor at the Lunar and Planetary Laboratory. "To do that, you need a large antenna, but those are too bulky to be carried on small spacecraft such as CubeSats. 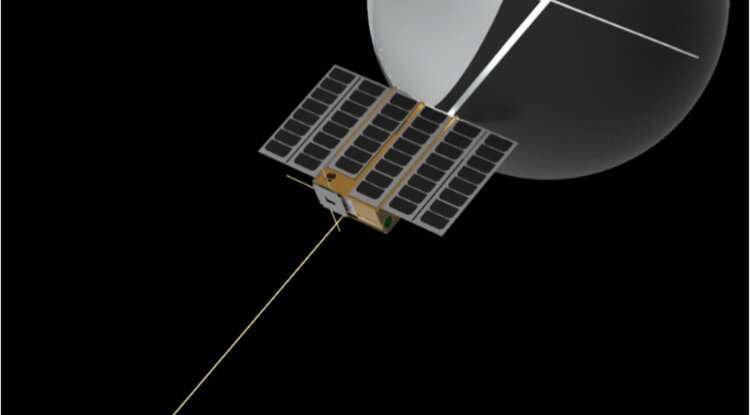 To overcome the problem of getting large antennas into small spacecraft, our group of students proposed a bold mission that would test a novel inflatable antenna system in space." CatSat is the size of a large cereal box. When fully deployed, the inflatable expands in a bubble gum fashion, forming a sphere three feet across that sticks out from one side of the box. An aluminized spot inside the inflated sphere is used as the communication antenna to beam data back to the Earth. Since Catsat will be in low Earth orbit, the data can be downloaded using a ground station located at the UA. CatSat is mainly a technology demonstration mission to mature this inflatable concept in Earth orbit. The ultimate goal is to fly such an antenna on an interplanetary mission that Reddy wants to lead to explore small bodies in the solar system. Inflatable antenna technology is the brain child of UA astronomy professor Christopher Walker, who is also the science principal investigator of the mission. FreeFall Aerospace, a local small business co-founded by Walker to advance inflatable antenna technology, helped the project as an industrial affiliate. Two engineering principal investigators – Roberto Furfaro, a professor in the Department of Systems and Industrial Engineering, and assistant professor Jekan Thanga, an assistant professor in the Department of Aerospace and Mechanical Engineering – are leading the student teams who are building the actual spacecraft hardware on campus.